Pope Francis Once Again Encourages Mothers To Breastfeed In The Sistine Chapel : The Two-Way During an annual baptism ceremony in the Sistine Chapel Sunday, Pope Francis once again encouraged mothers to breastfeed if their infants were hungry, saying this was a "language of love." Pope Francis baptized 34 babies Sunday in an annual ceremony in the Sistine Chapel. He repeated advice from previous years: mothers should feel free to breastfeed during the service. There are many spaces where women are discouraged from breastfeeding in public. Museums, airlines, and even hospitals have come under fire for not giving new moms enough support, or admonishing them for breastfeeding or pumping. But Pope Francis is a proponent of the practice, even in Catholicism's holiest places. In an annual baptism ceremony in the Sistine Chapel Sunday, the Pope encouraged mothers to feed their babies if they were hungry during the two-hour-long service. 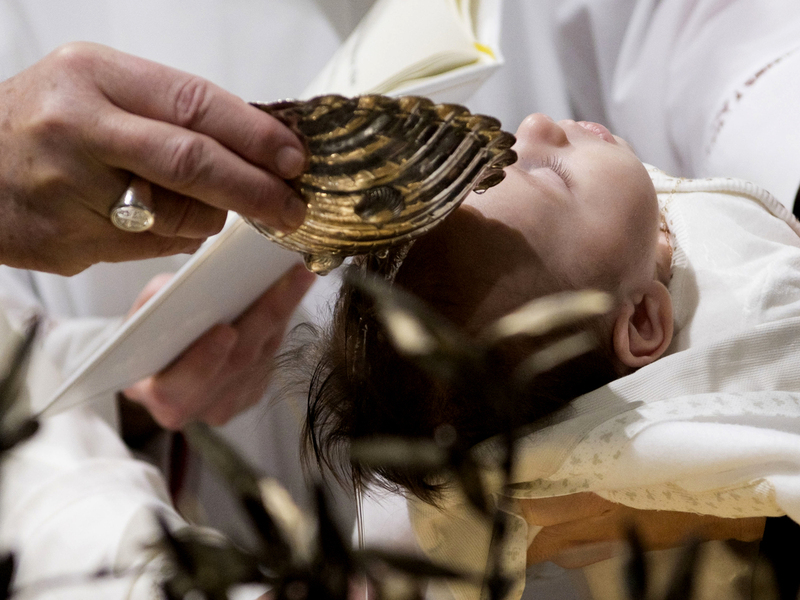 Vatican News reports that the Pope "appeared to enjoy every minute" of the baptism ceremony, blessing 34 babies of Vatican employees and the diocese of Rome. This ceremony occurs every year on the day of a Catholic feast marking Jesus' baptism in the River Jordan. The Pope gave a brief, "off the cuff" homily in Italian, telling parents to teach their children faith through "the language of love." "Babies have their own dialect," he added. "If one starts to cry the others will follow, like in an orchestra." He said that if the babies were "starting a concert" of crying because they were hungry, mothers should "go ahead and feed them," for this too is a "language of love." This isn't the first time Pope Francis has encouraged mothers to breastfeed in the Sistine Chapel. Last year at the same ceremony, the Pope made similarly supportive remarks, saying mothers should feed their children as "Mary breastfed Jesus." NPR's Rebecca Hersher reported that even though Pope Francis has "repeatedly justified his position in the most traditional terms possible — harking back to the infancy of Christ himself," not all Catholic churches have followed the same logic. "In a 2012 Christianity Today article titled 'Breast-feeding in the Back Pew,' writer Rachel Marie Stone recalled, 'On a family trip to St. Peter's Basilica in Vatican City, as I started to breast-feed my son in the sanctuary, I was whisked away by a security guard to the bathroom. "'Countless other Christian women, trying to feed their children without having to miss a sermon, have faced the disapproval of others who think breasts have no place in the sanctuary,' she continued.' "
Reuters noted that, though attitudes are changing in many countries, "Women still face harassment for breastfeeding in public." But this might be a relatively recent phenomenon in the Catholic Church. Neomi DeAnda teaches religious studies at the University of Dayton, and she notes that Pope Francis' stance might not be as radical as it seems. "The Catholic Church has traditionally had images of breast milk, which have actually been silenced over the last couple hundred years," DeAnda says. She notes the Milk Grotto in Bethlehem, believed to be the place where Mary first nursed Jesus. It has become a site of pilgrimage for new mothers and women trying to conceive. DeAnda thinks it's mostly positive that the Pope has consistently sent this message in favor of breastfeeding in public spaces. "For people who are squeamish about public nursing," DeAnda says, "It's a very positive message about how natural breastfeeding is." She adds however, that there's another side to the seemingly liberal attitude. "Both Pope Francis and the Catholic Church have focused on women as mothers, and the primary purpose of women's bodies to be reproductive," DeAnda says. "I think there's also a possibility of challenging what women's bodies do, and what are the Catholic Church's beliefs and theological stances around those pieces."